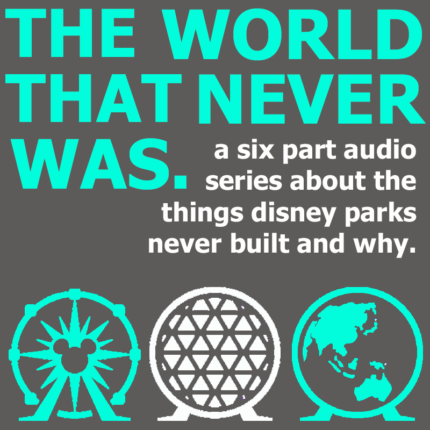 Friend of TMSM, Josh Taylor from Network 1901 and Modern Mouse Radio, has launched a new podcast series about “The World that Never Was.” For any Disney fan that loves the history or learning new things about Disney, this is the podcast for you. The first episode talks about the Epcot Pavilion Africa, that was never built. He talks about how it was promoted and the work that began and then why it stopped and never came to be. Below is the official press release put out for the new series and the links how you can get the first episode. The World That Never Was joins the Network 1901 feed as a journalistic audio show about the ideas the Disney company had for their theme parks and the social issues that stopped them from happening. The World That Never Was is styled after popular NPR shows like Freakanomics Radio. Using interviews with Disney fans, politicians, activists, pastors, and other professionals, Josh Taylor features a singular theme park idea that was never built and brings light to why it was never built. Part Disney, part real world issues, the show isn’t just for the Disney lover but for those interested in learning and discussing social issues, politics, religion, and more. The most recent episode featured a narrative story on Epcot’s Africa Pavilion that was never built due to lack of supporting countries in Africa. Political Wars, apartheid, and diseases prevented Disney from gaining an African country for their Epcot park. The show features interviews with a Disney podcaster, political activist, and a representative from Come Lets Dance, an organization helping Uganda rebuild its country and communities. The series will feature six episodes for its first season starting. Each episode is roughly 30 minutes and will be released every Friday starting on Sept. 2nd, 2016. Hosted by Josh Taylor who has been hosting Modern Mouse Radio, a Disney related podcast, since 2012. He has also been writing about Disney and Disney history since 2011 for several sites including WDWRadio.com and ModernMouseRadio.com. The World That Never Was is part of the Network 1901 feed which is available on iTunes, Stitcher, or wherever you can listen to podcasts. For more information you can contact Josh Taylor at Network1901@Gmail.com or visit http://www.Network1901.com.